This is one of those places where you are both lucky and unlucky to be. Bad that you have to be here. But if you have to be a place like this, better to be this place than many others. Business took me here, not personal matters, thank goodness. Which is not to take anything away from it. And besides, now I could never go at all. Which isn't as reassuring at it sounds. Anyway, where are these undulating aqua shapes? The winner received one of my scorned 2015 blog posters, which I have in abundance. Yes! The Ann and Robert H. Lurie Children's Hospital, 225 E. Chicago, is distinctive for its use of artwork--each floor is sponsored by a community partner, the Field Museum, the Chicago Symphony, the Botanic Garden. 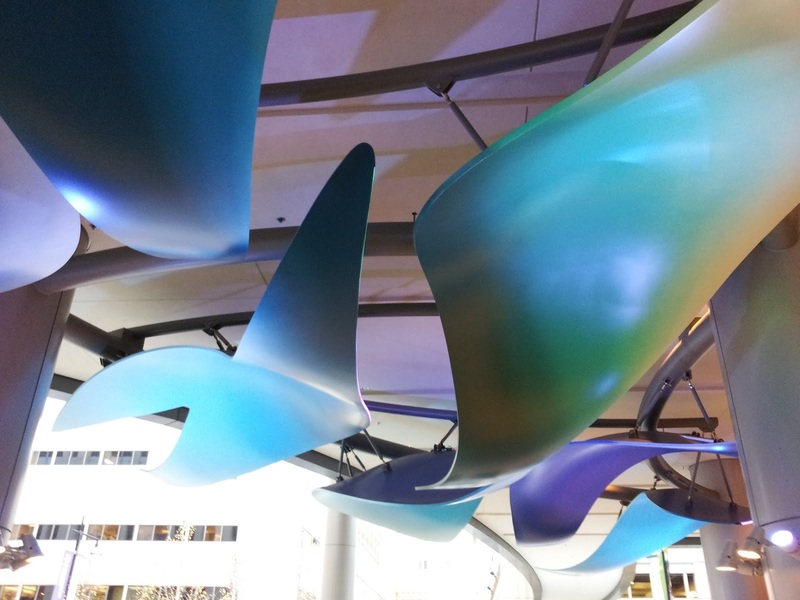 The lobby has an aquatic theme, thanks to the Shedd Aquarium, with a 24-foot model of a whale, and these pleasing blue shapes. Send your address to me at dailysteinberg@gmail.com and I'll send you your poster. Congratulations. Oh, and the forms are part of a sculpture called "Healing Waters" by Mark Davis. Northwestern University's hospital lobby? RIC? I guess there'll be a column on the hospital soon then, if it said business took you there. It ran three years ago. Thanks for keeping your promise about not posting at midnight and giving others who don't stay up late a chance. Yes, I know, it's your blog. The 7 a.m. shift on Saturdays is a change of routine, and so I keep forgetting it. If the only people who care are snarky asshats, I won't worry about it too much. Here's a non-snarky request. Some of us don't stay up late on Friday nights, but do get up early on Saturdays. A 7 am Saturday posting time would be appreciated. If 7 am is too early -- what about 9 am? Thanks for considering. Happily. I will try -- that's not a promise, it's an intention. But snarky asshats are so vital to the online economy! A great hospital indeed. We used to take our offspring there to see a children's endocrinologist.